1. This study examines how Hamas and the other terrorist organizations in the Gaza Strip make extensive use of Palestinian civilians as human shields. It shows how the terrorist organizations constructed a vast military infrastructure in the Gaza Strip, including a large arsenal of rocket and mortar shells used to target the southern Israeli population (in 2001-2008 more than 8,000 rockets and mortar shell were fired into populated Israeli areas). The terrorists' military infrastructure was hidden in and around civilian homes and dispersed to locations scattered around the Gaza Strip, home to an estimated more than 1.4 million people, one of the most densely populated areas on earth. 2. The calculated, cynical use of the civilian population as human shields is intended to decrease the vulnerability of Hamas and the other Palestinian terrorist organizations by affording them a kind of immunity from the IDF's counterterrorism activities, since they are aware that Israel avoids harming the civilian population insofar as is possible. It is also intended to make it possible for Hamas and the other terrorist organizations to make political-propaganda gains in the battle for hearts and minds by representing Israel as operating against innocent civilians. The terrorist organizations' doctrine of using human shields was inspired by Hezbollah's tactics in Lebanon and by the lessons they learned from the terrorist campaign they have been waging against Israel since 2000. 3. Today Hamas and the other terrorist organizations have approximately 20,000 arms-bearing operatives in the Gaza Strip with varying degrees of skills. They have light arms, anti-tank weapons, powerful explosive devices, and rockets and mortar shells. Their military infrastructure is situated in urban population locations (with Gaza City serving as the nerve center) and eight densely populated refugee camps throughout the Gaza Strip . 4. Hamas and the other terrorist organizations copied and developed Hezbollah's warfare doctrine, which is based on exploiting the civilian population as human shields. They adapted it to the unique conditions of the Gazan arena, which are topographically easier than those in south Lebanon . Using civilians as human shields is a war crime, a grave breach of the laws of armed conflict and a crime against humanity. Rockets and mortar shells are routinely fired from built up, densely populated areas and near structures and facilities (including educational institutions and mosques) provided special protection by the Geneva Conventions. In the scenario of an IDF incursion into the Gaza Strip, the terrorist organizations will use those urban and refugee camp settings as the focal points from which they fight. i) Military and security personnel, facilities and installations are situated within dense population concentrations (including residential dwellings and public institutions, such as schools, mosques and hospitals): The military infrastructure attacked massively attacked by the IDF during Operation Cast Lead, includes terrorist operatives, weapons, and the facilities and installations themselves: headquarters, bases, offices, arsenals, tunnel and underground networks, lathes, workshops and bunkers. Constructing a vast security-military infrastructure within the civilian population exposes it to frequent “work accidents” and puts it on the front line in the fighting when the Israeli security forces carry out counterterrorism activities or when there are violent internal Palestinian conflicts. ii) Rockets and mortar shells are fired at Israeli population centers from inside or close to private Palestinian residences and sometimes from educational institutions or mosques. The rocket launching squads deliberately situate their launchers near houses to camouflage themselves and to protect themselves from the IDF. The attacks carried out by the terrorists often disrupt the daily lives of the Palestinian population and endanger them. Sometimes rockets explode as they are being prepared for firing, and in some instances homemade Qassam rockets (whose technical quality is low) fall in the Gaza Strip instead of Israel and kill and wound local civilians. iii) The terrorists fight against the IDF from within residences and public institutions, and use ambulances to evacuate terrorist operatives from the battlefield: In Operation Cast Lead, terrorist operatives found refuge in facilities such as hospitals, educational institutions and mosques. In IDF operations carried out in recent years, including Operation Hot Winter in March 2008 and Operation Autumn Clouds in October 2006, the IDF often faced terrorist operatives fighting from within private residences and receiving support from civilians, including women and children, who patrolled and carried out intelligence missions. In some instances the terrorist operatives wore civilian clothing, making it difficult to distinguish between them and genuine civilians. During Operation Hot Winter the IDF found weapons hidden in a mosque in the Jabaliya refugee camp. During battles in the Al-Zeitun neighborhood in 2004, the terrorists used UNRWA ambulances to evacuate a wounded Palestinian and terrorist operatives. All are grave breaches of the laws of war and an exploitation of the special protection afforded to places of worship and medical installations and vehicles. iv) Civilians, including women and children, are deliberately used as human shields to protect terrorist operatives whose houses the organizations fear may be attacked by the IDF: During Operation Cast Lead and in many instances in the past, the terrorist organizations have exploited IDF warnings to civilians to evacuate their residences before attacks to send children and adolescents to the relevant locations, knowing the IDF will not deliberately attack civilians. Hamas prime minister Ismail Haniya and many other Hamas leaders (such as Nizar Rayyan, killed in Operation Cast Lead) have openly boasted about their use of their human shield tactics. v) The terrorists hold military training, exercises and shows of fighting , important for improving their fighting skills and raising morale, in the midst of population concentrations (where the terrorists feel more secure than in exposed settings). They endanger the civilians' lives, disrupt their daily routines, expose them to various types of work accidents (random gunfire, explosions) as well as to IDF counterterrorism activities. The Gazans have often appealed to the terrorist organizations to stop such activities, but without success. Exercises and shows of fighting increased during the six month lull arrangement prior to Operation Cast Lead. vi) Women and children are used as human shields: The terrorist organizations sent 200 women to rescue dozens of operatives from the Nasser mosque in Beit Hanoun in the northern Gaza Strip during an IDF action in November 2006. The terrorists mingled with the women, exploiting the fact that the IDF would not fire indiscriminately at a large group of women, and escaped from the combat area. Moreover, during IDF combat in the Gaza Strip in the past, the IDF often found terrorist operatives shooting at them while surrounded by children and adolescents , sometimes on their own initiative and sometimes prompted by the terrorists (incidents well documented and presented below). Women and children are also used in logistic operations and to carry out terrorist attacks (collecting intelligence, smuggling weapons, suicide bombing attacks). Such tactics may be repeated during Operation Cast Lead. 6. The civilian Gazan population pays a high price both with regard to personal injury and death (this study documents heavy civilian casualties caused by terrorist activity) and the severe disruption of their daily routines . Beyond the issue of using civilians as human shields, the entire Gazan population pays a heavy price for Hamas's policy, because when Hamas took over the Gaza Strip in June 2007, it turned its more than 1.4 million Gazans into hostages of its radical Islamic ideology and attendant strategy. Hamas forced them into a situation of unending combat with Israel , a harsh confrontation with the Mahmoud Abbas's Palestinian Authority, the deterioration of relations with Egypt and other Arab states, and isolation from the international community. 7. The fundamental contradiction between the needs of the civilian population and Hamas's policies is clearly manifested by the continuing attacks made by Hamas and the other terrorist organizations on the crossings between Israel and the Gaza Strip, the lifelines for the Gazans, and by the difficulties imposed by Hamas on their operation. Although for years Hamas has tried to falsely represent the situation in the Gaza Strip as a humanitarian crisis and even a “holocaust,” in effect it prefers carrying out terrorist attacks against Israel to caring for the basic interests of the Gazans. For the past few years the Kerem Shalom, Sufa, Karni, Nahal Oz and Erez crossings, through which fuel and other vital supplies are delivered to the Gaza Strip, have been repeatedly attacked with rocket and mortar shell fire as well as attempted mass-casualty and suicide bombing attacks. The rocket and mortar shell fire at the crossings continued during the six months the lull arrangement was in force. In addition, the terrorist organizations have publicly targeted the Ashqelon power plant, which provides the Gaza Strip with 65% of its electricity. 8. In the past, Hamas's use of civilians as human shields and its cynical and malicious disregard for their basic interests have led to harsh criticism from the residents of the Gaza Strip (even though Hamas makes an effort to minimize it in the media it controls), as well as the Palestinian Authority and Egypt . Hamas has ignored the internal and external criticism, refuses to change its policies and frequently exploits the shortages, poverty and suffering in the Gaza Strip as fodder for media campaigns attacking Israel , Egypt and the Palestinian Authority. 9. During Operation Cast Lead , which began on December 27, 2008 , the IDF has carried out precise attacks on the military infrastructure established in the midst of the civilian population. The Israeli air strikes from the air and sea against Hamas (and other terrorist organization) targets situated in civilian locations are acceptable according to international law. They have been carried out because of the State of Israel's need to afford security to its civilians and to ensure their welfare and basic right to life and safety in accordance with the principles of armed combat. For eight years Israeli citizens have been exposed to continual rocket and mortar shell fire, as well as other forms of terrorism, all originating with Hamas and the other terrorist organizations which control the Gaza Strip and operate from it . 10. 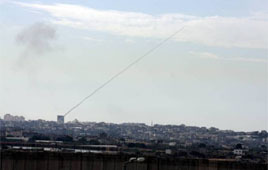 Hamas and the other terrorist organizations, for their part, carry out war crimes and crimes against humanity, both by the deliberate, indiscriminate firing of massive rocket barrages at civilian targets to sow terror, death and destruction, and by using the civilian population of the Gaza Strip as human shields. All of the above violate the basic principle of the distinction between combatants and non-combatants, which is one of the cornerstones of the laws of armed warfare. It is up to the international community to deal with the terrorist organizations and the countries which sponsor and support them (especially Iran and Syria ) with all the political and legal means they have at their disposal.